This year, only entries of 10 poems will be eligible for the first prize of pamphlet publication. of a 36 page pamphlet of their poems including 20 copies, and £100 cash. 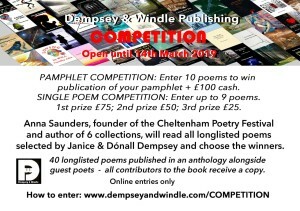 All long-listed poets will receive a copy of the Competition Anthology. who will select a long-list of entries in each category. Poems should not be longer than 40 lines including stanza gaps.